"The white balsamic vinegar enhances the flavor of fresh garden vegetables in your salad. 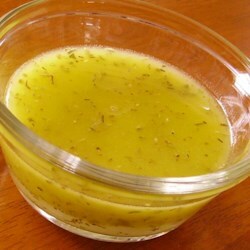 The dressing can be use immediately or if time allows let it sit overnight for better infusion of flavor from the herbs." Combine olive oil, vinegar, and Italian seasoning in a jar; cover with a lid and shake vigorously until mixed. See Chef John make a super-simple vinaigrette with complex flavors. It could use a bit more flavor, but it's a quick and easy alternative to store-bought salad dressing.